You want to know whether or not you're doing an mlm or pyramid scheme . . . ? A Pyramid Scheme is disguised as a business model that recruits people with the promise that they will get their money back by enrolling other people into the model instead of selling services or products. So basically when you join a pyramid scheme you're required to make a payment upfront, however you are promised to get a share of the money that is gotten from everyone that you recruit. Pyramid Schemes rarely involved any kind of product or service of any kind. The money you get is derived solely from the money that is collected by joining the organization. 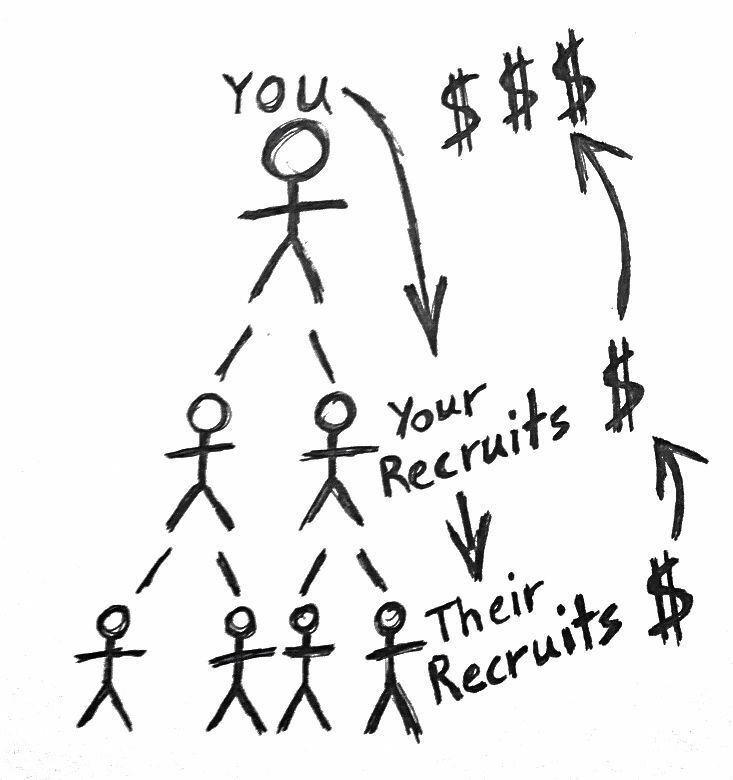 So the Pyramid Scheme is based on the fact that you ONLY make money when you recruit others into it. In this example, in most cases the people in the pyramid will get a cut of the $50 given by everyone below them. If you had no knowledge about the industry, would you be able to tell whether you're in an MLM or Pyramid Scheme? In the first example you can see that no product is involved, just money exchanging hands. In the second example you can see that the package is posing as the product, but it's a REQUIREMENT for the person in the Pyramid to buy the product in order for you to get paid. Due to the fact that it is very hard to tell between a legitimate MLM or Pyramid Scheme, critics will just call ALL the MLM opportunities a pyramid scheme also and bash the whole industry. The difference between MLM companies and pyramid schemes is the only way to make money in an MLM opportunity is by selling the product or managing a team of sales people who also sell the product. You're not REQUIRED to buy any products, buy training event tickets, buy business cards, or anything related to the company as a condition to join. You can make money by selling products directly to the customers. Will put more emphasis on recruiting people than selling the product. So . . . Are You Joining an MLM or Pyramid Scheme? One thing that should put up a red flag is when people try to recruit you in an MLM structured business that only talks about their personal wealth and material items. Sometimes they may only sell you a list of MLM leads at a high price. Another usual red flag is when they have over priced items that's are available in your local vicinity at regular price. If an organization of a pyramid structure has no product, you pretty much know it's a pyramid scheme. However if it is a product-based pyramid scheme most likely it will be a REQUIREMENT for you to buy your own products in order for someone else to get paid.